Today, Martin Luther King Jr.’s birthday, we want to draw a parallel between Dr.King’s historical commitment to non-violent resistance and a recent act of non-violent civic courage. 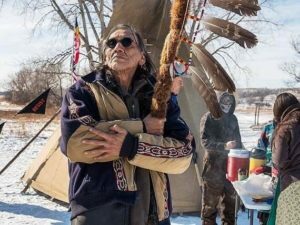 In an incident now widely publicized, native elder Nathan Phillips — a Vietnam veteran and member of the Omaha Nation who was visiting Washington, D.C. to attend the Indigenous Peoples March — performed a powerful act of grace on the Washington mall. As reported, the incident began when a small group of black men who identified themselves as Hebrew Israelites and a group of male students on a school-sponsored trip to attend an anti-abortion march began to have an altercation that quickly grew in intensity and energy. As the tension and possible danger built, Nathan Phillips and other Indigenous people stepped in between the two groups to try to deescalate the conflict. Rather than turning away in silence, or pushing back against either group with physical intimidation or angry words, Phillips beat his drum as he and his companions sang “Raymond Yellow Thunder Song,” a song of resistance and remembrance honoring the life of an Oglala elder murdered by white settlers in Nebraska in 1972. Later, Mr. Phillips said he felt an obligation as an Indigenous person to intervene. “But this is the commitment when I picked up the pipe 27 years ago. It’s for the next generation. It’s when that moment comes and you got to stand your ground. That commitment that you made to either fulfill that or you don’t. I mean, I was scared and I didn’t want to. I really, really didn’t want to, but nobody else was,” Phillips said. Nathan Phillips chose non-violent resistance in a way directly comparable to Dr. King, whose Southern Christian Leadership Conference was committed to achieving full equality for African Americans through nonviolent protest modeled on the teachings of Gandhi. (Their motto: “Not one hair of one head of one person should be harmed. )”Not only did Mr. Phillips in his commitment to “the pipe” through this act, and Dr. King in his life’s work, choose the non-violent path to effect change, protection, correction, and the righting of wrongs, they also chose to sing and speak with the voice of poets. They were guided by their belief in the talismanic power of the best words — in the word as sacred Word. And so the poetry of an Indigenous anthem to serve as a barrier against hate and intimidation on behalf of others. And so, in Mr. King’s case, the poetry of his sermons and speeches, many of them stitched and illuminated with the work of the poets he loved, including Langston Hughes: “I Dream a World” — A world I dream where black or white/Whatever race you be,/Will share the bounties of the earth/And every man is free. Therefore today, in honor of Dr. King’s birthday, we invite you to read the poets and seers of the Black and Indigenous nations. Let’s look to them for guidance, whether we read from the sometimes vexed position of whiteness, or from within these historically oppressed groups. Together, let’s all remind ourselves of the beauty and horror of this mixed, complicated country through the words of those who have chosen to celebrate their lives and shine a light on injustice through singing. The terrible divisiveness baked into our society and represented so clearly by the confrontation on the mall can seem like an unstoppable force. But read these books and the vision becomes so much larger. Stop for a moment, now, and hear Mr. Phillips on the subject of what he sees as possible: “I see a future though. I do see a future. I see a bright, beautiful future if we want it, if we’re willing to pray for it, it’s there for us. It’s ours to pass on to the next generation, but we got to be willing for it,” Phillips said.